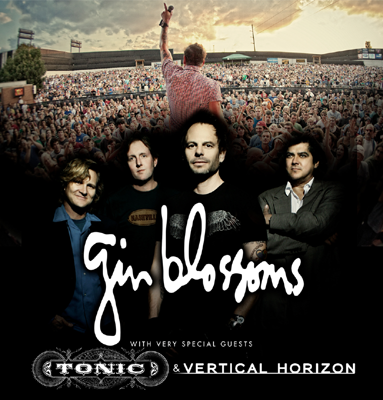 Gin Blossoms with special guests Tonic & Vertical Horizon will play White Oak Amphitheatre at the Greensboro Coliseum Complex on Sunday, June 3. Tickets go on sale Friday, April 13 at 10am at LiveNation.com, via the Live Nation app, the Greensboro Coliseum box office, Ticketmaster, or by phone 800-745-3000. The Gin Blossoms have undoubtedly left their mark on the Rock music map. The Grammy nominated band's fusion of Melodic Rock, Pop, Folk and Country elements has helped pave the way for the modern Rock of today. Fans around the world are very familiar with Gin Blossoms’ five-time Platinum breakthrough album New Miserable Experience, containing gems like “Until I Fall Away,” “Found Out About You,” “Hey Jealousy” and “Allison Road.” Those hit tracks were followed up by the Empire Records Platinum Soundtrack hit, “Til I Hear It From You.” In 1996, the singles “Follow you Down” and “As Long As It Matters,” hit the radio again in a huge way, making their Congratulations I’m Sorry record another platinum success. Gin Blossoms hits have crossed over in five different formats, taking the airwaves by siege, and held the MTV playlist captive for most of the 90s. Boasting record sales of over 10 million, the band continues to burn up the road performing over 120 tour dates per year as they ready a brand new record release in Summer 2018. Don’t miss all these great hit songs, a sampling of new music, and a rockin’ the house down show!